Successfully garnering everyone’s attention with aggressive price of M2, Infocus will now introduce M330 for 9,999 INR via Snapdeal. 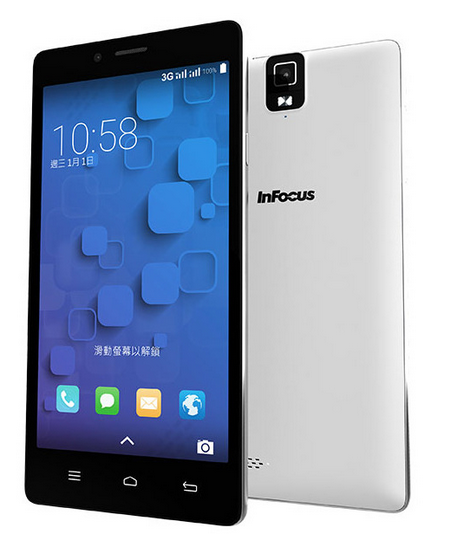 The new Infocus smartphone has a Phablet sized display, Sony Exmor Camera sensor for front and rear snappers and Octa core CPU. The 5.5 Inch IPS LCD display has 1280 x 720 pixels spread across it, managed by MediaTek’s MT6592 octa core chipset with Mali 450 GPU, 2 GB RAM and 16 GB expandable native storage. The display also lists Gorilla Glass 2 on top for added protection. For photography, there is a 13 MP Sony Exmor R sensor on the rear side with F2.2 wide aperture lens on top, which can record 1080p full HD videos. Detailed 8 MP front shooter has a trendy wide angle lens (75 degree) with f2.4 aperture. On paper, this sounds at par with the best you can get for the price. The phone isn’t very slim with a 9.3 mm waistline, but that’s ok as it makes room for a juicy 3100 mAh battery. Other features include 3G HSPA+, WiFi 802.11 b/g/n, Bluetooth 4.0, GPS and USB OTG. Software is Android 4.4 KitKat based inLife UI. The handset will compete against phones like Yu Yureka, Xiaomi Redmi Note and Huawei Honor 4x in India. Since Snapdeal has already listed and started teasing the device, you can expect it to be available before the end of this week.